The Art Spirit Gallery owner and founder Steve Gibbs passed away from ALS on New Year's Eve at age 64. In early November, Steve Gibbs was honored with the Karen Mobley Arts Impact Award by Spokane Arts at the nonprofit's annual costume ball. The assembled crowd of artists, arts patrons and gallery owners stood and gave Gibbs a standing ovation. Gibbs, however, could not stand. He was seated in a wheelchair, the result of amyotrophic lateral sclerosis (ALS), which he'd been diagnosed with earlier in the year. That didn't stop Gibbs from accepting the slew of congratulatory hugs that were to follow, with the same warm smile with which he had long greeted visitors to his Art Spirit Gallery in Coeur d'Alene. On New Year's Eve, Gibbs' smile faded, as the renowned arts ambassador passed away at age 64, just six months after his ALS diagnosis. Gibbs had retired last fall and made plans to pass on the gallery, which he owned for 20 years, but many in the arts community were nevertheless surprised by the speed at which the neuromuscular disease took his life. Gibbs moved to Coeur d'Alene in the mid-1990s and soon met artist John Thamm, who had a studio space that soon became the Art Spirit Gallery. During his time at Art Spirit, Gibbs told the Inlander in an interview in October, the gallery had sold more than $3.5 million in paintings, sculptures and other media, almost all of it created by Inland Northwest artists. Gibbs often was the welcoming face at the front of the Art Spirit, and was keen on taking visitors into the gallery's basement, which housed thousands of pieces that he kept in archives. 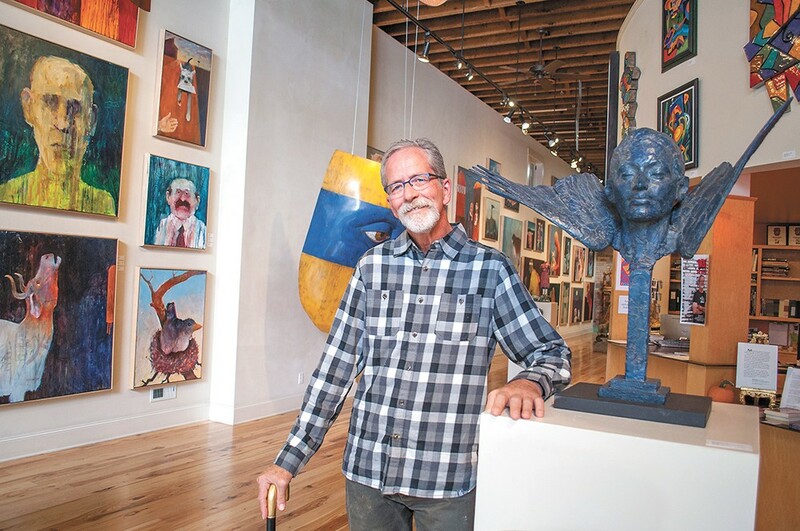 Upon his retirement, Gibbs was confident that the Art Spirit would remain a bright spot in a growing Coeur d'Alene creative landscape. "We have a very good crew in here that has been showing how well it can run with me stepping away," he told us in October. Gibbs also was instrumental in starting Coeur d'Alene's Second Friday art walk, and was involved in a number of nonprofit boards in the area, as well as the Idaho Commission on the Arts. A memorial for Gibbs will be held on a yet-to-be-determined date in February. Keep an eye on the Art Spirit Gallery Facebook page for details. In the meantime, the gallery opens a show of renowned Spokane artist Harold Balazs' work on Jan. 13.